Product prices and availability are accurate as of 2019-03-29 18:35:48 EDT and are subject to change. Any price and availability information displayed on http://www.amazon.com/ at the time of purchase will apply to the purchase of this product. 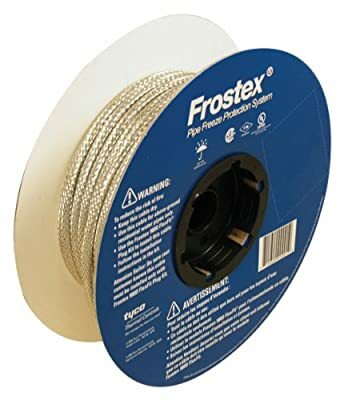 The Frostex pipe freeze protection system prevents above ground residential water pipes from freezing. The system includes a 3 watt per foot electric heat trace cable, 9800 FlexFit plug kit and 9610 application tape. The heat trace cable uses a self-regulating conductive core that reacts to changes in temperature. As the environment becomes colder, cable resistance decreases and more heat is generated. Conversely, as the environment warms, cable resistance increases and less heat is generated. 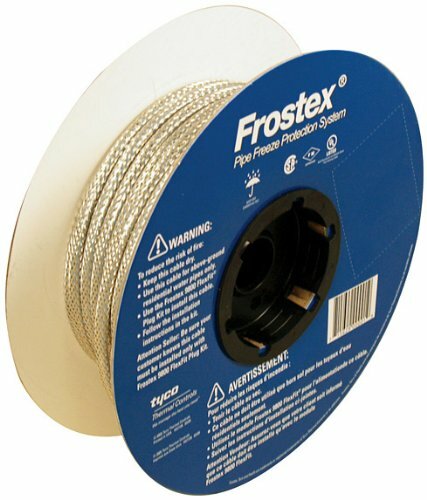 The Frostex 9800 FlexFit plug kit is used to terminate the heating cable. The 9800 includes a specially designed ground-fault protected plug and an end seal for sealing the cable end that does not plug in, as well as a power indication signal light.